In Uvea, the people speak a language closely related to Tonga, the term for bark cloth in the island of Uvea is ngatu. Paper mulberry, hiapo, is cultivated on the east coast where rainfall is heavy. Double layers of ngatu are beaten out and pasted together and are designed using freehand designs or kupesi-imprinted methods. 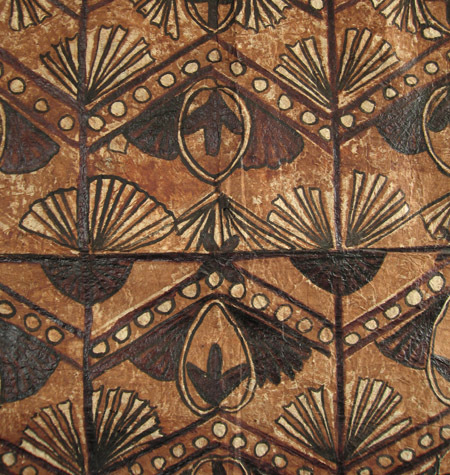 If the kupesi pattern block is used, it is made form the midrib of leaf sewn to wads of leaf as in Tonga, and this is the traditional style for Uvea to make designs on the cloth. As in Samoa, the general term used for tapa in Futuna is siapo. The name for the paper mulberry plant is lafi. Siapo is the term used when large pieces of the cloth are made by groups of women. 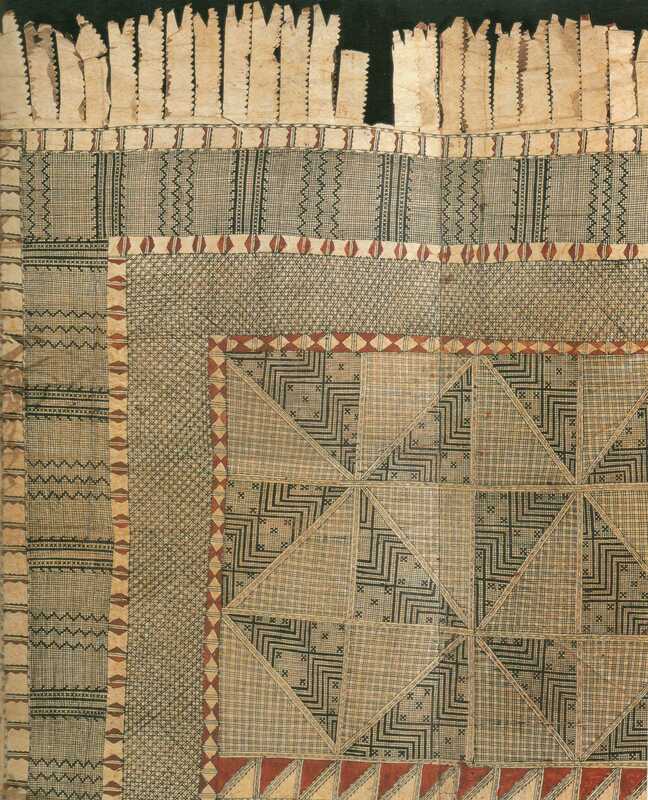 A salatasi identifies a smaller sheet made by a single individual that is made into a waist wrap to be worn. The bottom of an old canoe is carved for use as a design tablet, in the style of Tonga. Designs are also applied using bamboo pens or pens made from coconut midrib. The pens are used to draw very intricate patterned designs. Ruled grids are also drawn to create squared-off areas for a variety of patterns within one piece of cloth. As a finishing touch, sometimes the edges of an article are cut into fringes. Today, costumes for dance consist of a tepi skirt, a lafi sash worn over one shoulder, and a white turban wrap for the head. Borders on tepi skirts are sometimes created by using freehand painting with a brush and fine lines applied with a pen. 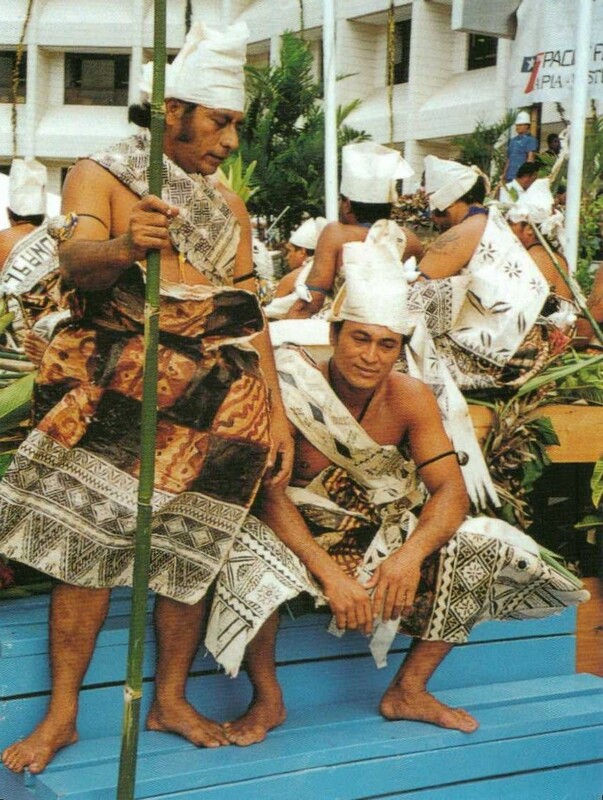 “Dancers from Futuna at the 1996 Festival of Pacific Arts, Apia Western Samoa. The dress of these dancers consists entirely of newly made tapa, from the white turban to the lafe bandolier and the tepi skirt (p.64, Pacific Tapa, R. Neich & M. Pendergrast). Dyes used in Samoan siapo come from nature. They are extracted or ground from nuts, tree bark, tree sap, roots, and seeds. There are five colors collected: oʻa is brown, lama is black, ago is yellow, loa is red, and soaʻa is purple. The traditional designs are symbols that reflect Samoan natural environment. There are 13 symbols used in siapo and they represent nets, coconut leaf and sennit, the trochus shell, pandanus blooms, pandanus leaves, breadfruit leaf, sandpiper bird designs, starfish, banana pod, rolled pandanus leaves, worm (this is almost extinct), centipede (which has been discontinued), and lastly, logologo (not found in modern siapo to the point that the meaning of this design has been lost). Original siapo artworks are made by combining these design elements (siapo.com). There are two kinds of siapo design application methods practiced in Samoa and they are Siapo ʻElei (the rubbing method) and Siapo Mamanu (the freehand method). 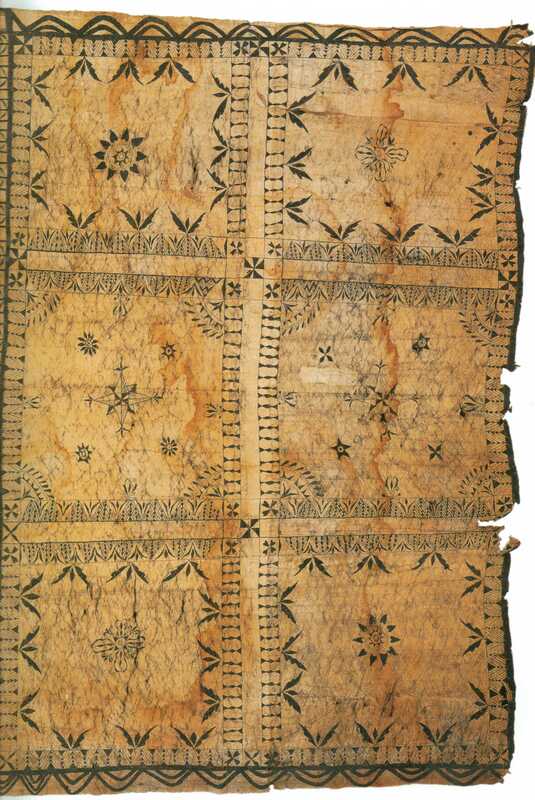 The Siapo ʻElei method leaves an imprint on the uʻa (bark cloth material). This is done by laying the uʻa on a design printing block that is carved into wood, called an upeti, and rubbing the uʻa with a swab that has been dipped in oʻa. Oʻa is a brown dye that is extracted from the bark of the Bishofia javanica, or blood tree. This is a pest in the Hawaiian Islands where it is known as the Bishop Tree or is called koko (blood). 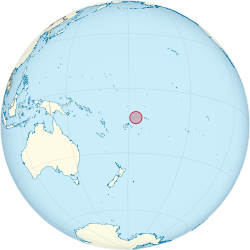 It is also called koko in Tonga and other island languages. The oʻa changes color over time from a pale tan to a rich, dark brown. The next step in the process is to rub a red color over to define the design. Arrowroot plant is used as glue and is dabbed on any small holes, and then a second layer is placed on top and rubbing the oʻa is repeated, this time pressing the two layers together. Sections are joined using arrowroot and rubbing. This is usually the end of the process for large pieces known as ululima and uluselau. But for smaller pieces called vala, the design might be highlighted with more brown dye. Upeti in the older form was of both the sewn midrib variety as in Tongan kupesi, and also carved wood. Today, the men have been carving the upeti and have become the main artist of siapo ʻelei designs. However, they still base their designs on the traditional symbols. One upeti carving can yield many different imprints as dye can be applied to certain areas only to create an interesting design using the positive and negative space (Pacific Tapa, p. 16, 1997). 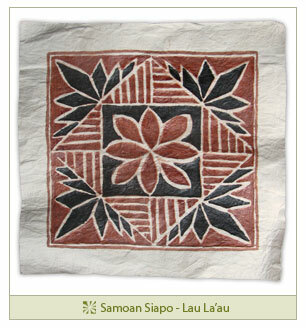 Siapo is the common name used for bark cloth in Samoa. The siapo is the paper mulberry tree bark for the material called uʻa. The bark is prepared in the common way of removing and preparing the bast. The tools used to beat out the uʻa is the anvil called a tutua, which is about 3 feet long for a single person to work, or six feet long for two or three people to work together. The beater used is called an is called an iʻe. The iʻe has two smooth sides and two grooved sides. After the uʻa is beaten into a sheet, it is dried in the sun and made ready for design applications.